This installation was created in collaboration with Rocio Robles, as specialist in interior architecture and commercial design. Making for this participation a delivery solution custom-made. 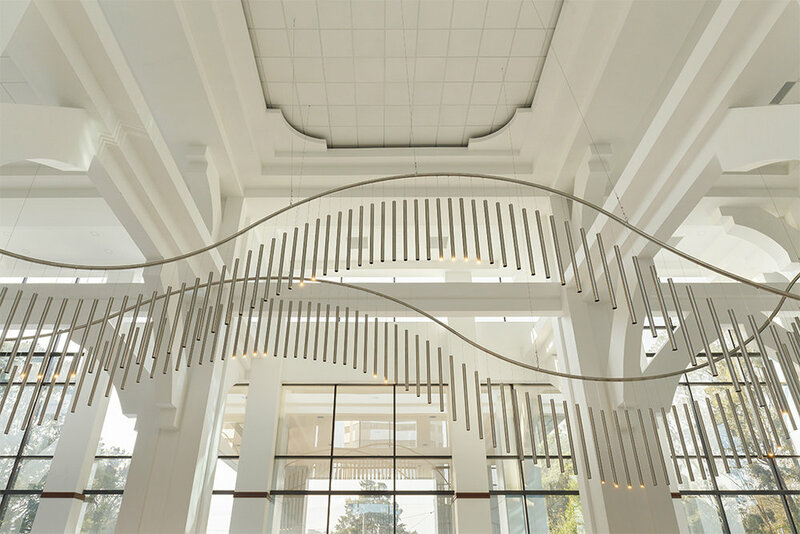 The design consists of a representation of the connections being made at the lobby of this trade center located in the business heart of Guatemala City. Creating the illusion of a floating ceiling, of lights, making a perfect lighting mood for the lobby during the day and after dark. The new interior design for the corporative lobby of Europlaza comprised a 500-linear meters semi-circular hanged screens light that enveloped the reception. For this it was necessary implement 50 tubes for each 6 linear meters of installation. The main two challenges were the vast amount of daylight & sunlight, as well as the monumental scale of the existing lobby ceilings - reaching over 8 meters of high. To brings human scale to the lobby and creates intimacy after dark.